Two wythes of masonry, usually brickwork used as an external wall. The wall cavity provides thermal insulation and a moisture barrier. 1. 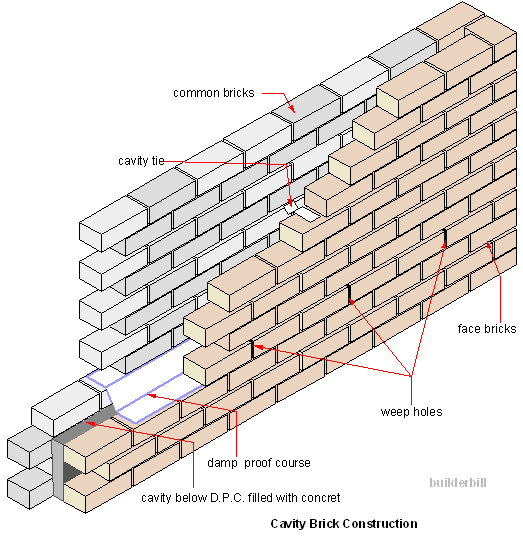 )A continuous vertical section of masonry one unit in thickness. 2.) A dividing wall between two adjacent flues in a chimney. A layer of impervious material used in masonry construction to prevent ground water or moisture rising into a building's walls. Pressed metal, wire or plastic ties that are used to tie the separate wall sections or wythes together in cavity brick wall construction. 1. )Holes in the lower section of retaining walls to allow water to pass through the wall. 2. )Raked vertical joints in the outer skin of cavity walls, just above the DPC to allow water to exit the cavity. These walls because of the cavity are always built in stretcher bond. The architect or designer will usually specify the number and placing of the cavity ties which are essential if the wall has to have any strength at all. The ties come in a variety of patterns and materials. The pressed metal and wire types always have a kink in them at the middle which must always point down to allow any moisture to drip off. The bricklayer lays the ties in the first skin built as the work proceeds and then the second wall when it is being built gets the ties bedded in also. The ties are fixed in a staggered pattern. The DPC can also be a variety of materials. It is usually placed a couple of courses higher than outside ground level. The inside part of the DPC sits one course higher than the outside to allow any accumulated moisture to escape through the weep holes. The weep holes are simple end joints every third brick or so that have no mortar in them. The cavity is normally 50mm or 2" wide. It must be kept clean and no mortar dags should be allowed to bridge the gap between the brick skins. The normal sequence is for the brickies to get all the walls up to DPC height and the the cavities up to that level are filled with concrete.